In the summer of 1995, I traveled to the northern rim of the Colca Canyon, in Arequipa, Peru, accompanied by my daughter Tina and Carlos Machicao, a colleague and friend who at the time, used to teach civil engineering at Arequipa's National University of San Agustin. Our party included a driver and a local guide. We left Arequipa early on the morning of July 28, and after several hours of arduous travel across deep canyons and majestic mountaintops, managed to reach a town where we found many people gathered in the main plaza, celebrating the anniversary of Peruvian Independence. Unaware of our exact whereabouts, I introduced myself to a lady in the crowd and asked her the name of the town. She said: "This is Machahuay." I asked her: "Is this the town that the "Mambo de Machahuay" was named after? She answered: "You are quite right." We were pleasantly surprised and proceeded to engage the locals in spirited conversation. Later on, our party climbed a nearby hill to get a better view of the breathtaking surroundings. Once there, we sang, at full volume, the "Mambo de Machahuay." The experience was one that would be hard to forget. voy a visitarla a mi cholitay. llegando ya a Lima la voy a dejar. to listen to the music. 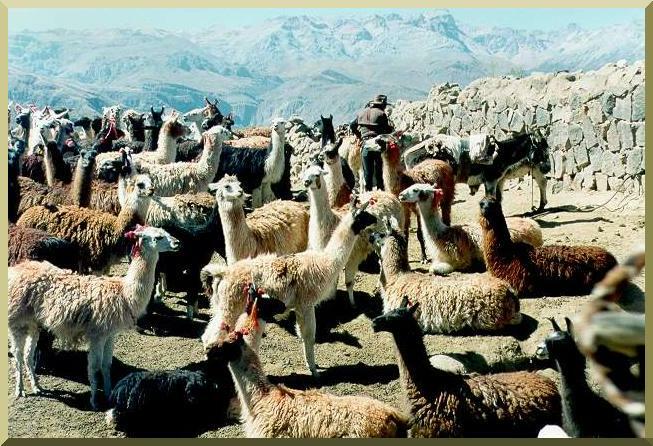 A herd of llamas at Viraco, near Machahuay, on the northern rim of the Colca Canyon, Arequipa, Peru.